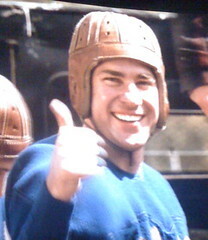 After anxiously and excitedly waiting for over a year to see if my once-in-a-lifetime experience working on the set of the new Hollywood movie Leatherheads, starring George Clooney, Renee Zellweger, and John Krasinski which hit theaters nationwide on Friday, actually resulted in face time in the movie, I'm thrilled and honored to announce I'm IN the movie!!! WOO HOO!!! Sweeeeet! Can you tell I'm stoked?! 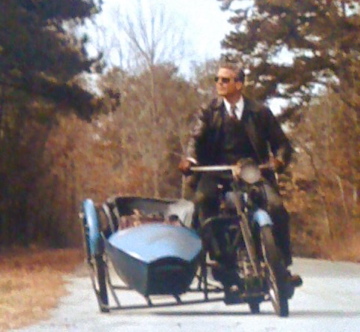 That big tall guy on the left standing there looking down with a condescending face at Clooney's character coming off of his motorcycle--THAT'S ME (CLICK HERE to see a blown-up version of this still shot)! In all, this scene was about 8 seconds long total and I was on screen for about 5 seconds. It wasn't much screen time when you think about a two-hour movie, but I felt extremely fortunate to have gotten that much time. 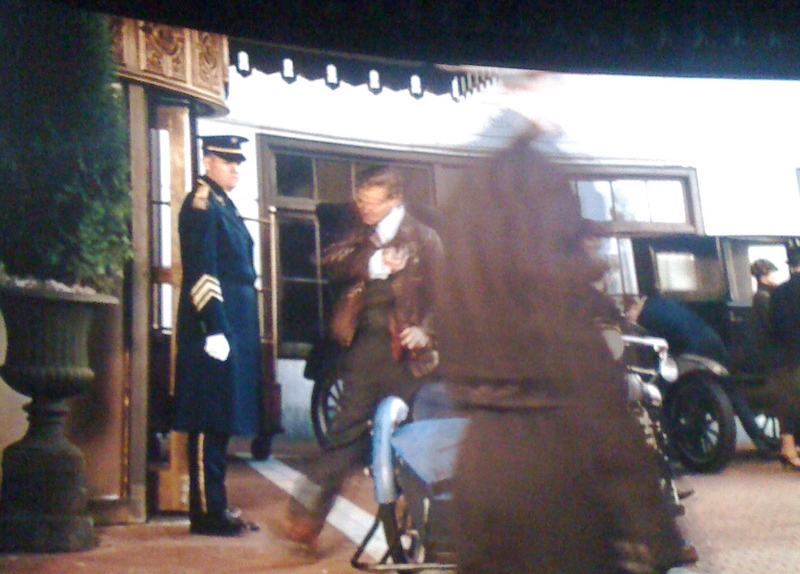 Many of the hundreds of extras either got a flash-in-the-pan blip on the screen or nothing at all. I was indeed lucky and appreciated the opportunity to be a part of something so special. Now, Christine on the other hand was as giddy as a schoolgirl when she saw me standing there and couldn't keep quiet. 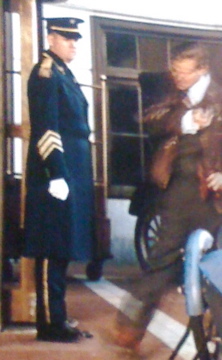 As soon as she realized that was me standing at attention next to George Clooney on that spittin'-and-sputterin' motorcycle in front of the hotel, I thought they were gonna throw her out of the theater for causing such a ruckus. She started whoopin' and hollerin' pointing her finger up at the screen saying, "Oh my God, there you are, oh my God, there you are!" I tried to get her to put her hand down and lower her voice as people were starting to stare. She was proud and happy to see her man in a real live movie. What a neat moment I'll always treasure for the rest of my life. Just a couple of hours after the matinee showing of Leatherheads at our local theater, Christine and I got all dressed up in our formal attire and headed down the road a few miles to Greenville, South Carolina where a group of several hundred extras got together to watch the movie together and to reminisce about our time on the set of a Hollywood film. It was neat meeting up with many of the extras who I shared hours upon hours of waiting and waiting and waiting with last year just so we could make it to this moment of glory. Everyone was grateful this time had come and we even got the royal treatment from the local press, too. 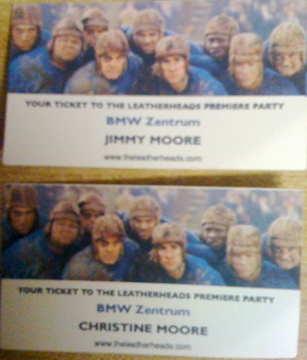 As the movie was getting close to the end, I leaned over to Christine and said that we should leave early (since we had already seen the film once that day) to beat the crowd over to the BMW Zentrum where the after-party would be taking place. She agreed and we headed out the door. Three seconds later we heard this loud explosion as a bright light filled the stormy sky--a transformer had blown from the major thunderstorm that was moving through the area and the entire block immediately went black. Boy, that was great timing! It turns out the movie had JUST ended and the closing credits were showing, so nobody missed any of the movie itself. At the earlier showing, we stayed all the way through the ending credits to see if my name would be there as "The Doorman." It wasn't. I guess they only put your name in there if you had a speaking part and I did not have one--although it was VERY close to happening. Interestingly, even if I did end up having that speaking role in the scene I was in, it would have been cut. They chopped off the last 5 seconds of that scene where the line was scheduled to happen and went right to the next scene where Clooney's character clashes with Zellweger's character inside the hotel. Oh well! At the after-party, I was interviewed by a reporter from The Greenville News and they quoted me first in their story. It was an unbelievable experience that will give me something to talk about besides livin' la vida low-carb for the rest of my life. If you haven't seen Leatherheads yet, then do yourself a favor and GO SEE IT! It's a great film that just about anyone will love and enjoy. You can read all of my blog posts and see lots of pictures I took while on the set of Leatherheads at my "Livin' La Vida Low-Carb Links" blog. 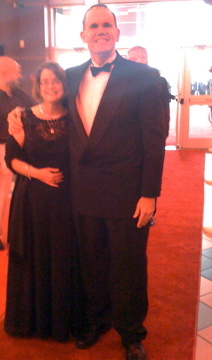 Special THANKS to Jim Fair who created the extras web site TheLeatherheads.com and organized the Red Carpet Gala for us to treasure this moment. It's one I won't soon forget! And I can't wait to buy the DVD this Fall! let me just be the first to say, congrats! what a cool experience! And anyone who has done any film editing should know that 5 seconds is HUGE on film. Congrats!!! Defin need to see the movie!!! THANKS anonymous! The casting company and directors were clueless about my blog. I got the part because of my height and slim build. In other words, I FIT THE SUIT! Hey, whatever it takes. 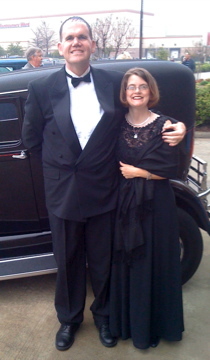 And to think this would have NEVER happened had I still weighed 410 pounds like I did in 2004. Those five seconds on screen made it TOTALLY worth it! Congratulations Big Man, you made it. -- What lies at your finger tips though is even greater! -- It's interesting that the 'Star' and the 'Star Struck' 'Look at me' 'See me' 'Show' thing and then the 'we who like to watch these performances' that has made Hollywood. Then it's that the stimulant 'highs' from drugs has lots and lots to do with all this. -- Yes, stimulants highs are major players in movies and television and theater. Carbohydrates are stimulants that make us high and want to show and be seen. -- Hollywood has always been loaded with cocaine and amphetamines and alcohol and caffeine. (Elvis Presley and a million more). Now it turns out that sugar and carbohydrates have been major players in this too. Ronald Reagan loved jellybeans. In old times the 'Kings' and 'Queens' in Europe with there 'highs' from stimulants and sitting on there thrones from all of there sugar highs and with all of there gold and linen and jewels and crowns and then there 'court jesters' and 'clowns' for shows was in the same realm of showing and acting and pretending and watching. It's fun though and we all love to watch and I'm glad you made it, congratulations. -- I'm sure this is to philosophical. I just couldn't resist that chance to make an important point. Looking good! Both of you looked great in your fancy clothes for the party afterwards. Maybe one of these days you will be on television? You could host a low-carbing show along with Christine. I know you can do it. I saw the movie Friday night and thought that was you standing by the hotel when George Clooney drove up. Too bad they didn't include your speaking part, but it's great you made the final cut. We'd LOVE that Jennifer. All in due course. :) YouTube will have to suffice for now. Absolutely this is a benefit of livin' la vida low-carb, Dan. Had I not lost the weight, I would not have been able to fit into the suit. No fit, no part, no movie. But it DID fit, and I DID get the part that made it into the final version of the movie. WOO HOO!!! Congrats Jimmy. 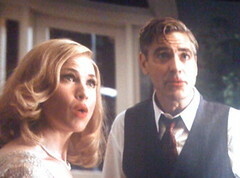 I'm a huge George Clooney fan so I'll definitely watch the movie soon! Looking forward to meeting you and Christine in Phoenix.